Shopify is unbeatable when it comes to a great product (almost life-changing), incredible marketing chops, and the might of the brand name itself. At the last count, Shopify had 377,500 paying customers (with a growth of 56% from last year) and about 100+ million people buying from stores powered by Shopify. Almost every SaaS company worth its salt knows that using a “free trial” is the best kind of a growth hack to bring in potential customers. When you give a free trial and when a potential customer signs up, it’s almost half a sale made. If your product is good enough, the free trial user will convert. If your product is great (like it is with Shopify), it’s next to impossible not to convert from a free trial to a paid plan. In the case of Shopify, there’s nothing more compelling and almost tangible when free trial users come in and “build an e-commerce store” — that’s sweat, blood, tears, and an actual “little something” that users create (which could also make them money later). 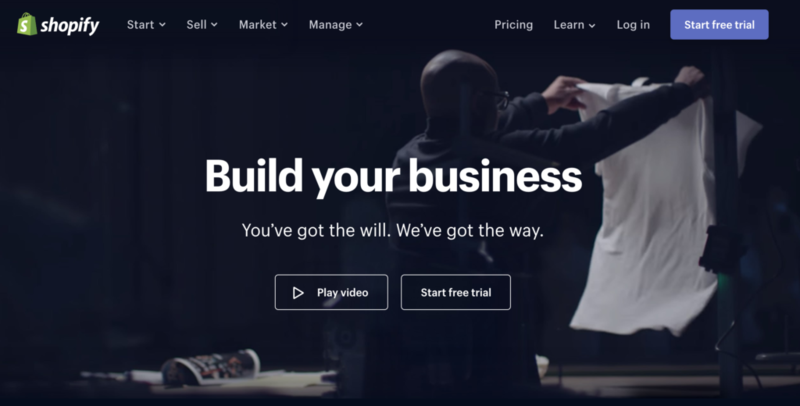 By the time you are done with Shopify’s 14 days free trial, you’d have chosen a domain, picked a theme, created the store itself, added products, and more. It’s hard to close shop after you put in that kind of effort now, can you? Provide a free trial if your business allows for it (valid for almost all SaaS companies). If you don’t have a free trial, you are missing out on a lot. I don’t have a product really. 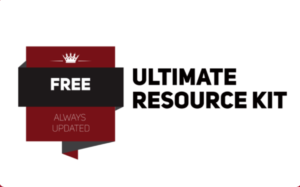 For that reason, I created a free membership resource kit. Shopify runs creates a humongous mix of content — including a well-established blog, guides, videos, podcasts (see below), online courses (see below), and an active forum. 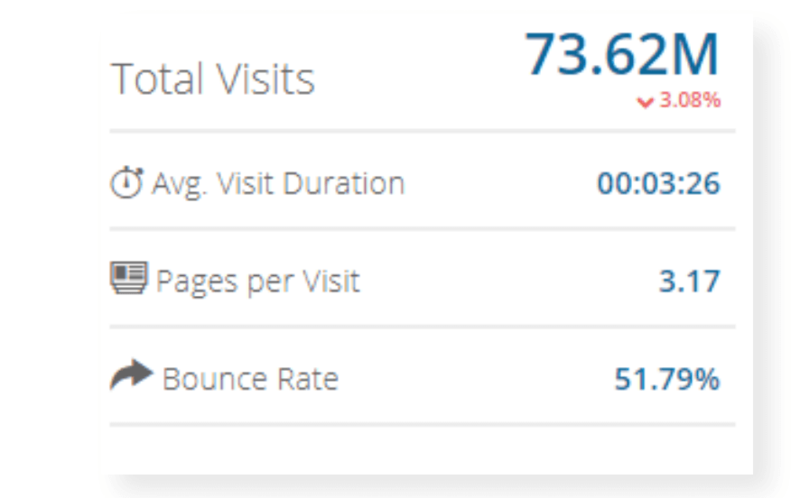 According to Sumo, the Shopify Blog alone got about 27,000,000 views last year. That wouldn’t have been possible if it weren’t for a consistent blogging schedule which ultimately helps them generate leads with their massively successful free trial. On top of the sheer value the blog alone creates, they also have guides that have seen around 65,000 downloads. This is not even including the Shopify Academy, Shopify Partner & affiliate resources, Shopify Apps marketplace, Shopify exchange marketplace, and more. About blogging & content marketing, it bears repeating here: publish blog posts regularly on your blog (on schedule), stay active on social media, and use content marketing to your advantage. Content marketing, when you do it right and consistently enough, is badass. Starting with Shopify and building a store is involving as it is. Throw in a competition or a contest and you have a lot going for your business. 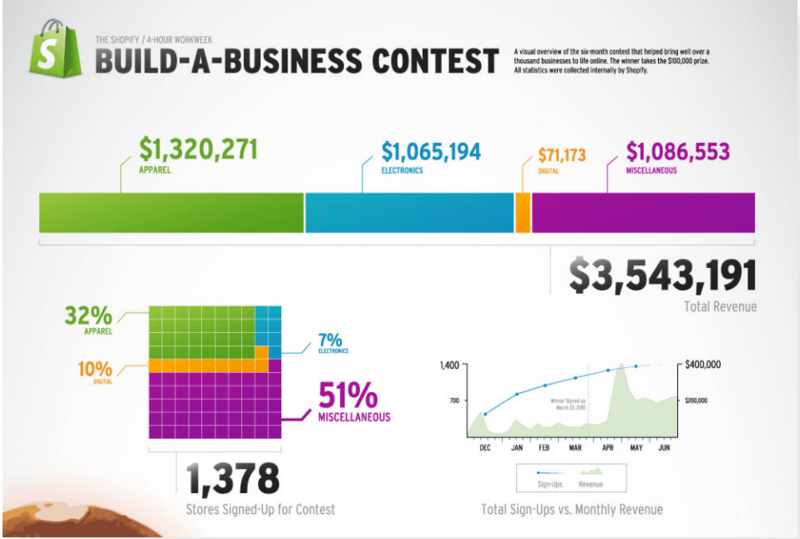 When Shopify ran it’s “Build a Business Contest”, the e-commerce behemoth added monthly revenue of $400,000 for itself at the peak of the contest. The competition resulted in 1378 new store sign-ups resulting in a grand total of $3,543,191 in revenue made by individual store owners. You don’t even have to be a big brand like Shopify to make this work for your business. Use tools like Viral Loops or Sumo’s KingSumo to make it work for your business. I’ve also compiled a huge list of top referral software and apps that you can use to make it happen. If you are as hungry as I am for knowledge, you’d not want to wait until a webinar goes live (like sometime in the distant future), remember the date (or add to your calendar), and then actually spare time to attend the webinar. While doing regular webinars has its charm and does work, it might just be a tad too much for someone who just came visiting your website. This is the age of instant everything. Your visitors would like instant information — in the form of webinars — for immediate consumption. That’s why you need Instant webinars or pre-recorded webinars that your users can sign up for and consume immediately. The key is to run automated webinars on evergreen topics that your ideal customers might be interested in. Shopify runs pre-recorded webinars, delivered to users as soon as they sign up. Wondering how to launch instant webinars for your own business? Use Demio’s new automated webinar platform that helps you create and launch automated events and scale up your webinars. 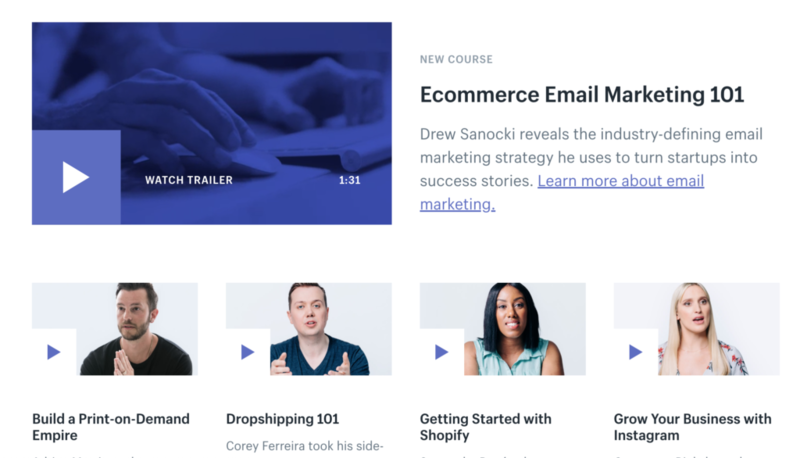 Shopify uses the Shopify Academy to create awesome courses that can help new (and also veteran) entrepreneurs to succeed with their e-commerce businesses. The online courses on Shopify Academy are free. Shopify wants to make premium education for entrepreneurs completely free, without you having to spend the next $1000 on some course or waste time watching random videos on Youtube. Now, as with any online course, there’s an instant connect that’s created between users and instructors or the brand. While Shopify doesn’t push you to sign up for a free trial, it does go all out to educate, train, and to inspire you with the academy. You don’t have to spend thousands of dollars to create online courses for your own brand. Just signup with Podia and launch your online courses, membership sites, and sell your digital downloads. What do you do for your top of the funnel marketing or branding or marketing efforts? Most businesses barely get around to publish their blog posts regularly or strive to maintain a social media presence. Shopify takes their “top of the funnel” to a completely different level: they provide free tools, free stock photos, and several other tools that are highly useful and relevant to entrepreneurs who are looking to create their first (or even their 18th) e-commerce store. Shopify’s free tools (over 21 tools and growing) include a logo maker, a pay stub generator, a business name generator, slogan maker, a QR code maker, a terms & conditions generator, a business card designer, a tool to help you create gift certificates, and many more. Each of these tools pack value and all of them are free for you to use. What can you create that you can give away to your potential customers? Shopify has one of the most respected, generous, and attractive partner programs and also an affiliate program. While Shopify’s partners are more involved in actually helping their respective clients create, run, and manage e-commerce stores, affiliates mostly recommend Shopify to their blog readers. 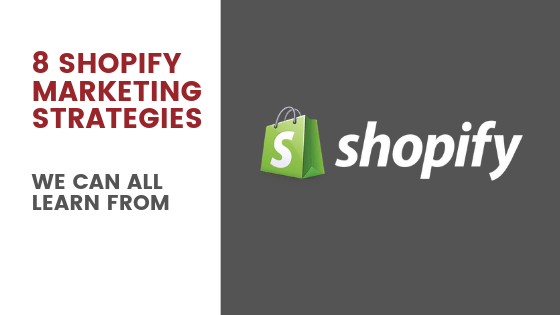 Shopify’s bounty program which shares up to 200 to 300% of customers’ revenue for a month of the particular Shopify plan they choose is well-known. Depending on your business (and especially if you sell digital products, online courses, or if you have a Saas business), launching an affiliate program is a great way to bring in sales driven by affiliates or partners around the world. Use Shareasale (best for regular e-commerce businesses and product-based businesses) for launching a formal affiliate program or perhaps use PartnerStack (best for digital products, digital downloads, online courses, and for Saas businesses), depending on the type of business you run. Note: If you create online courses as I do, platforms like Podia and Thinkific also have in-built affiliate marketing solutions to allow you to build and nurture your own army of affiliates. Did you know that not everyone reads blog posts? They’d rather listen to a voice or watch a video. For creators, it’s easier to create podcasts consistently than it is to create blog posts. Further, according to Chris Ducker, the average podcast is about 35-minutes which is equivalent to 4,550 words (about 6 blog posts). A single Podcast episode can pack as much value as 6 blog posts can. Shopify’s Podcast called Shopify Masters is an incredibly popular Podcast show (with more than 1,542,000 listens as of last year) where they also show off amazing case studies of how other entrepreneurs succeeded with Shopify by launching and running their respective e-commerce businesses. There’s something to be said about your voice when it actually comes out as your “voice”. Podcasts are only getting popular, thanks to the fact that people can listen in while they move about, wait, go to the gym, commute by metro or bus, or even while driving to and from work. Podcasts are almost always overlooked as another channel for you to create content as a part of your content strategy. If and when you do launch podcasts, it helps you spread your wings by that much more and help grow another audience right away. Plus, podcasts allow you to instantly connect with your audiences, allow repeated touch points with your brand for your audience, and are easier to create while letting you produce long-form content packed with value, as Tanya Hall — CEO of Greenleaf Book Group — notes. What lessons can you pick from Shopify? Tell me about it.